The plan is progressing since ABC Companies, Faribault, MN, acquired the TMC Group, Elkhart, IN, and the Ameritrans brand in 2012. This step was made to both diversify ABC Companies’ product range to include a midsize cutaway and add a manufacturing component to the business. According to Barry Hines, general manager, Ameritrans Bus, Inc., with the expansion of the manufacturing facility, the company is now set to go. The project includes the recent annex of an additional 60,000 square-foot building about a block away from the existing facility. The larger space, comprising four separate plants, accommodates the structural and skinning operation, paint shop and final fit and finish of the new line. Ameritrans says it is the only small bus OEM to extend the steel cage structure below the floor line. Ameritrans’ extends below the floor line and behind the skirt. Littrell says the significant style changes are akin to what has taken place in the automotive industry over the last several years. He points to the smallest model in the line, the E Series, which features a totally new look. 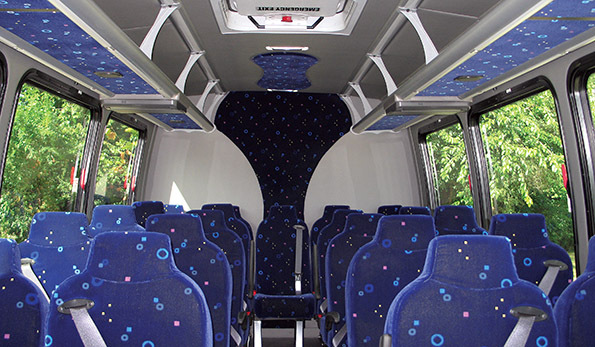 The design changes actually provide 10 inches more lateral head and shoulder room for passengers, as well as bigger windows and an all-enclosed entry. The door is flush with the outside; nothing protrudes. 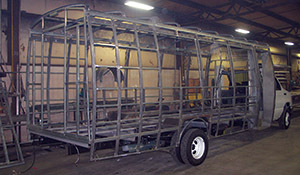 According to Littrell, Ameritrans is also the only small bus OEM to extend the steel cage structure below the floor line. Ameritrans’ extends below the floor and behind the skirt. Hines says the bigger buses ranging from 33 to 42 feet, particularly the Ford F330, Ram R330 and Freightliner M2, are taking Ameritrans to new places in the market. 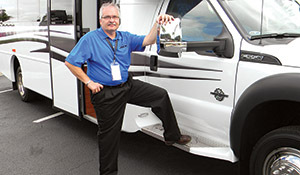 Ameritrans National Sales Manager Mike DeMarco says demand for the larger R330 and F330 has increased significantly. According to DeMarco, Ameritrans builds intentionally to the high-end luxury market. The company says it has no intention of marketing to public agencies for transit services such as paratransit or on on-demand shuttle services that typically employ small and midsize buses. Once thought of as a quietly run company with limited distribution, the Ameritrans dealer network is making itself known with sales representatives extending into all 50 states. Barry Hines, general manager, Ameritrans Bus, Inc., comes to the company with over 30 years in the bus industry. Hines says because Ameritrans products are more expensive than other brands, it is easier for potential buyers to see and understand the difference in pricing. He says it is fairly evenly balanced with the 28-foot to 39-foot models accounting for the core business. Hines says the company is also receiving inquiries for specialty applications requiring 4X4 drive. He says the company is already working on a few orders, which they will begin on this summer. Though not the largest, churches are turning out to be an important market niche for Ameritrans, due mostly to active dealerships such as Carpenter Bus, Franklin, TN, and Davey Coach, Sedlia, CO. The company estimates that the church market currently represents about 5 to 7 percent of its sales, but expects this niche to grow. An upshot to all of this, DeMarco says is that Ameritrans is enjoying quite a bit of repeat business.